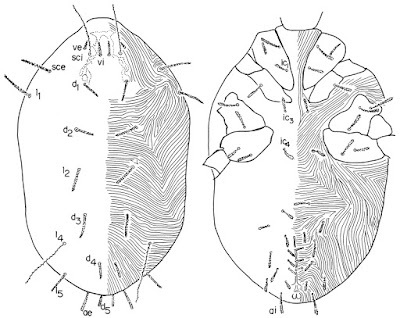 Dorsum (left) and venter of Ereynetes meliponae, from OConnor & Klimov (2012). 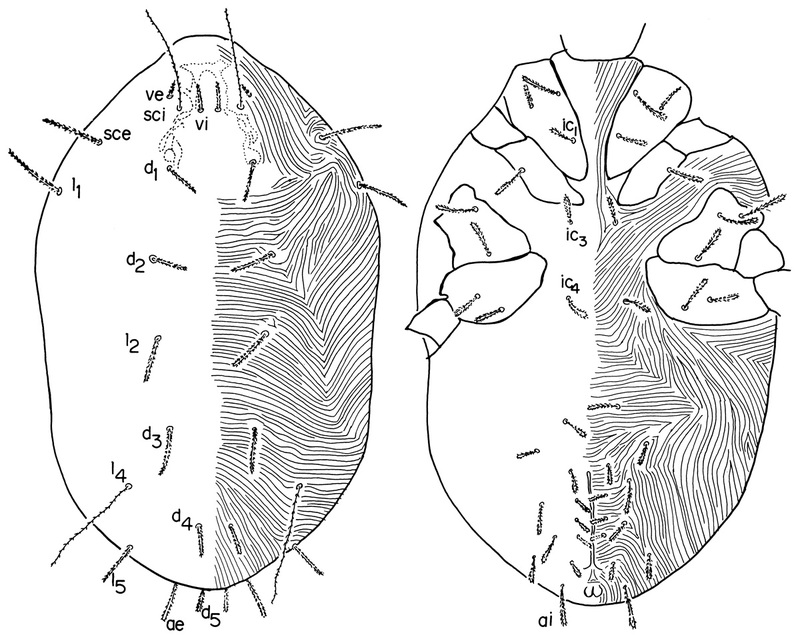 The Procurvata are a group of mites united by a procurved dehiscence line across the prodorsum (André & Fain 2000). It unites the Ereynetidae, which have two pairs of genital papillae, a characteristic deeply recessed solenidion in a sac-like structure on the first leg tarsus, and are often ornamented in a net-like pattern on the prodorsum and legs, and the Iolinidae, which have a single pair of genital papillae and usually have three or four elongated setae at the end of the tarsus (Walter et al. 2009). [AF91] André, H. M., & A. Fain. 1991. Ontogeny in the Tydeoidea (Ereynetidae, Tydeidae and Iolinidae). In: Dusbábek, F., & V. Bukva (eds) Modern Acarology: Proceedings of the VIII International Congress of Acarology, held in České Budĕjovice, Czechoslovakia, 6–11 August 1990 vol. 2 pp. 297–300. SPB Academic Publishing: The Hague. [F76] Fain, A. 1976. Acariens récoltés par le Dr. J. Travé aux iles subantarctiques II. Familles Acaridae, Anoetidae, Ereynetidae et Tarsonemidae (astigmates et prostigmates). Acarologia 18 (2): 302–328. [G39] Grandjean, F. 1939. Observations sur les acariens (5e série). Bulletin du Muséum National d’Histoire Naturelle, 2e Série 11 (4): 394–401. [PM88] Polaco, O. J., & W. Mendl. 1988. Occurrence of mites in Mexican land snails. Nautilus 102 (3): 129. [RP91] Raut, S. K., & A. Panigrahi. 1991. The mite Fuscuropoda marginata (C. L. Koch) for the control of pest slugs Laevicaulis alte (Férussac). In: Dusbábek, F., & V. Bukva (eds) Modern Acarology: Proceedings of the VIII International Congress of Acarology, held in České Budĕjovice, Czechoslovakia, 6–11 August 1990 vol. 2 pp. 683–687. 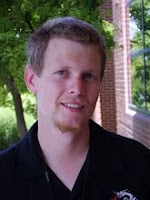 SPB Academic Publishing: The Hague.